This weekend I will be doing my first "craft" fair ever. I am a little nervous to be quite honest! I have always shied away from events like this, BUT I decided I would make a few exceptions this year in order to try and share my work with more people in Chicago. So, if you happen to be in the neighborhood, this Saturday I will have a small table set up for Versionfest13 as part of the SMALL Manufacturing Alliance. It's from 1-7pm, Saturday June 15 located at Maria's and Pleasant House Bakery: 960 W 31st Street Chicago, IL (in Bridgeport). Admission is free! For more information and to learn more about what is happening at Versionfest13 check out the link here. Hope to see you there! 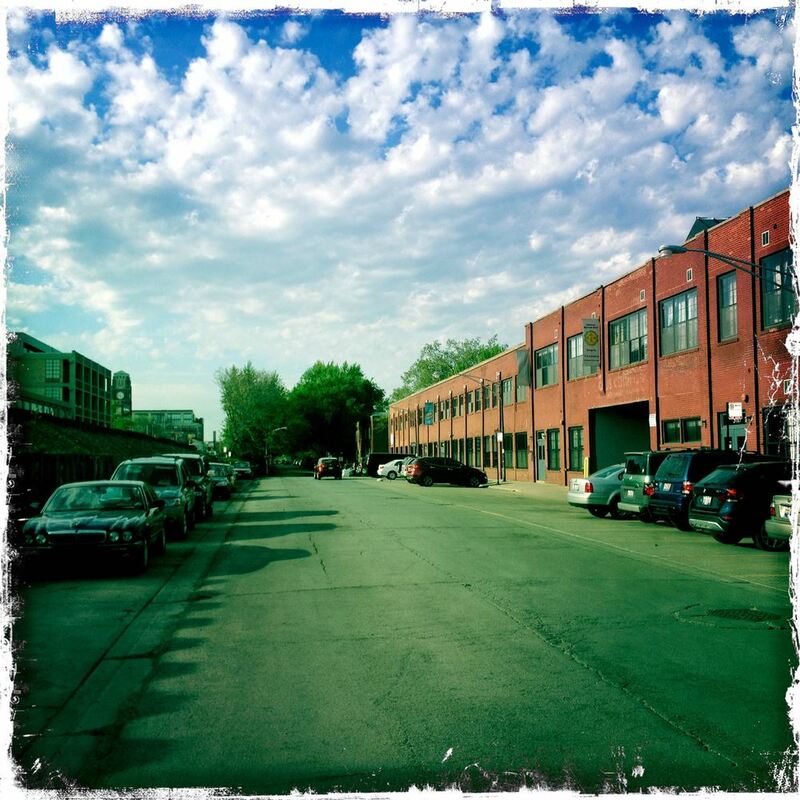 I am very excited to announce that at the end of this month I will be relocating studios in Chicago. My new space won't be moving far, but I will go from a 50 square foot "mouse house" to a 500 square foot studio space. I am *really* excited about this. This new space will offer so many more opportunities and I am looking forward to sharing those with you! The total space is 500 square feet, but I will only get about 350 sf since the front space will be occupied by The Nevica Project and Jayson Lawfer. There are great times ahead. 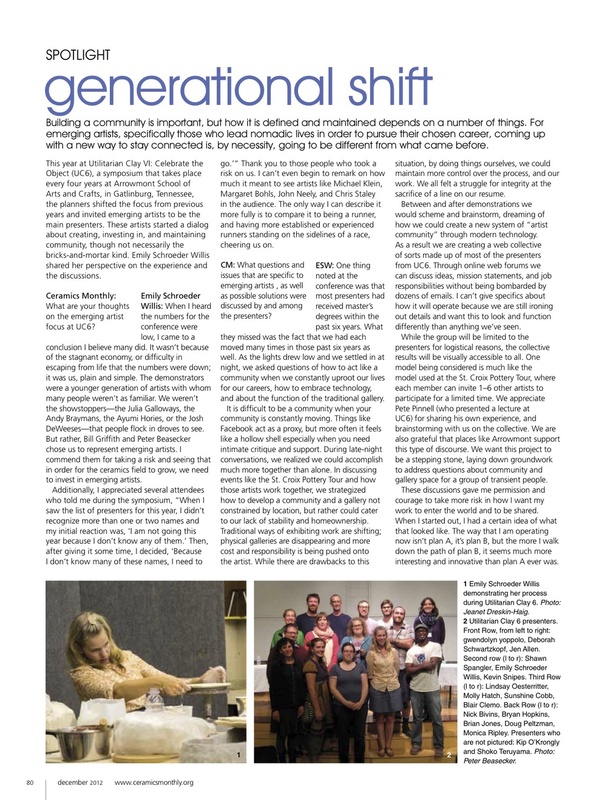 Here is the spotlight article with Ceramics Monthly discussing Arrowmonts Utilitarian Clay Conference and the creation of the artist run group Objective Clay. Originally published in Ceramics Monthly, December 2012, p. 80. So for those of you in or on your way to NCECA in Houston, see if you can find this little gem hidden somewhere! Artist Adam Field has put together a great line up of artists who have donated pieces to hide around Houston and 36 lucky folks will get to take these home with them! Follow it on Instagram at #Hidenseeka . If you find him, you get him! Here is a snippet of some of the other folks involved. What a crew! "Originally published in Pottery Making Illustrated, March/April 2013, pp. 17-21. Just a friendly reminder, I am still doing free shipping through my Etsy site for any purchase over $70. For purchases $70 and under it is only $5. Not too shabby! I just posted several vases, both small and large, that would make great table centerpieces. Not to mention, what girl wouldn't like a beautiful boquet of tulips in one of these for Valentines Day? Last week I did a photo shoot with my friend and incredible photographer Darcy Demmel. 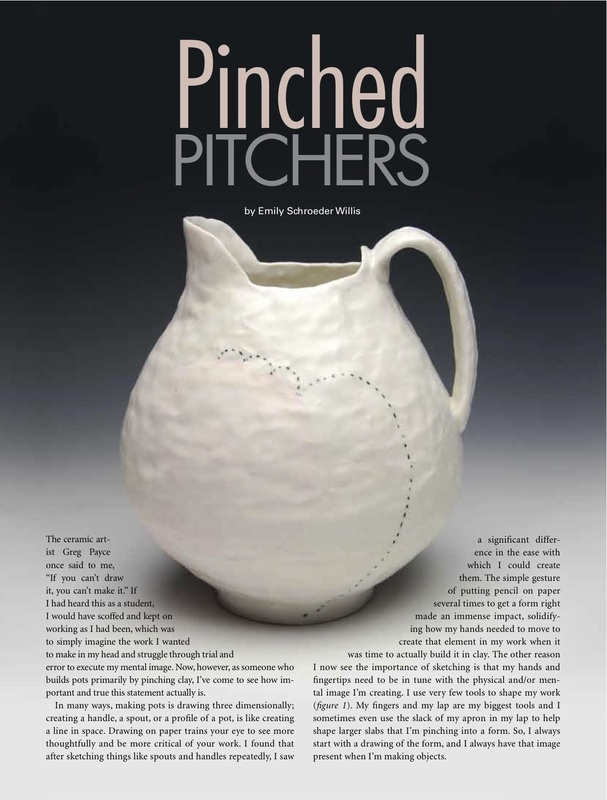 I am going to have an article in a ceramics magazine talking about my process and detailing how to build a pitcher! I am really excited to have more details out for you soon, but in the mean time. Here is a peek! Well, I have been in a bit of a predicament. I have some larger pieces that I have wanted to glaze, but I can't quite fit them in my glaze bucket. I know that you can pour glaze over the pieces, but I don't want my work sitting in a pool of glaze. I know that some people use a foam or sponge to help support it, but I didn't feel that would quite work either. Enter the mesh screen! I realied I could build a little mesh screen on a frame to hold the work up above the bottom of the bucket. That way, I can pour the glaze over, the glaze goes through and my work isn't sitting in a pool of glaze! The total cost was bit ridiculous considering what it is, but it was only because I didn't have a lot of the tools I needed (such as a miter saw). I know that i can use these tools again in other contraptions, but here is the finished product! So this month, not one, but TWO articles came out in two different magazines. I knew about the article in Ceramics Monthly, but I didn't know about the plug in Ceramic Review! So that was a real treat to see that! Almost two months ago now, I cam back from Arrowmonts Utilitarian Clay Symposium and I was really energized and invigorated by that time together. So much so, that i began writing a little something, just for my own personal record. Then I thought, "Maybe someone else would want to hear about this?" and so I sent a note to Ceramics Monthly with my article and asked if they would be interested and lo and behold, they were! The article is a little insight into some of the ideas and conversations that went on late into the night at UC6. It was so great and I feel very fortunate to have had such great artists for company. If you have read it, I would love to hear your thoughts, even if you didn't go to the conference! You can pick up a copy at any large bookseller. I think I could honestly type for the next 3 days straight with all of the fun and incredible things that have occured over the past week. I got home from Arrowomont on Sunday with a great group of new friends and endless amounts of inspiration. What a joy! I also just discovered that I was selected as plate #1000 for the Plate a Day blog which is one of my favorite blogs to pop in on. I can't even say honored I am to receive the comments that artist and blogger Carole Epp made for my work! All of that to say...I am heading out tomorrow to do a workshop in DC at the Lee Arts Center for 2 days and then I will be back again and hopefully able to post some information and talk a little bit about my experience. Just wanted to let you know I now have my work available at the Crimson Laurel Gallery in Bakersville, North Carolina! They are a really wonderful gallery and have a great selection of work to choose from. I know that there are many people like myself who still like to handle, touch and feel an object before they buy it, so for those of you living in the Carolina's area...here you go! So, I have had a bit more time on my hands lately than normal and I have decided to do a bit of updating to the website. Just wondering what you think? I wanted things to feel a bit more cohesive and also to have a simpler feel. I feel like I am still just hitting the tip of the iceberg when it comes to figuring out how to design and plan a website. I would love your feedback and insight! It's so hard balancing all of the different facets of being an artist. Hopefully by early next week I will have some new work posted on Etsy. Additionally, starting July 3rd, there will be an exhibition with The Nevica Project here in Chicago and you can check out some of the work that will arrive out of my kiln either tonight or tomorrow! Needless to say, there is a lot of new work coming at you in the not so distant future. Here is a preview of some work that will be available on Etsy soon. I hope you like it! 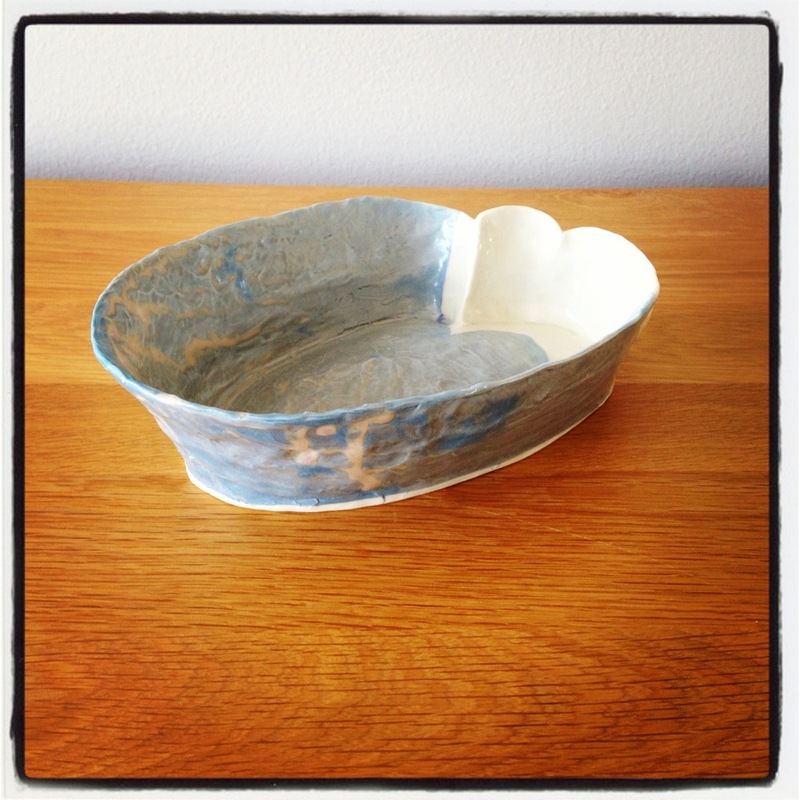 We got this little gem at the St. Croix River Pottery Tour on Mother's Day Weekend. Exited to see more of his work at the Arrowmont Utilitarian Clay Conference. Sign up for the conference if you haven't yet, there are only 200 spots available! #1. And last, but not least! Come and see the Subtle Change exhibition at Parklane Gallery in Kirkland, WA (it's on the Kirkland/Bellvue NCECA Bus Tour or you can take the 255 bus from downtown Seattle for $2.50). It features work by Kim Dickey, Sam Harvey, Leanne McClurg Cambric, Emily Schroeder Willis and Holly Walker. Here is a preview!